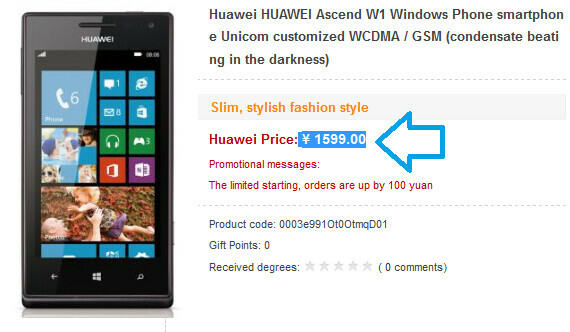 The Huawei Ascend W1 is the first Windows Phone 8 model produced by Huawei. Recently introduced at CES, the handset is expected to be released during this quarter in Russia, India, China and some European destinations. Featuring a 4 inch WVGA display, the device is expected to be powered by a dual-core 1.2GHz Qualcomm Snapdragon S4 MSM8230 processor and an Adreno 305 GPU. 4GB of native storage can be expanded by use of the 32GB capacity microSD slot and there rests a 5MP camera on back. At CES, pricing was the major bit of information that was not given out by Huawei, but that has changed. 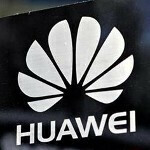 Huawei has placed a price of ¥1599.00 ($257.13 USD) on the phone, making it a reasonably priced model. While the Chinese manufacturer just introduced the Huawei Ascend W1 at CES, according to Huawei Chairman Richard Yu, at next month's MWC in Barcelona Huawei is expected to reveal the Huawei Ascend W2. This model, also powered by Windows Phone 8, is expected to feature a larger 4.5 inch HD screen with a dual-core processor, 1GB of RAM and 16GB of native storage. An 8MP camera is on back and a nice-sized 2800mAh battery keeps the lights on. All of this will supposedly fit inside a 7.7mm case. Usually, more than 1 month elapses between the time the sequel to a smartphone is introduced, but hopefully Mr. Yu has a plan up his sleeve.